P1: The wizard of Eo shouted into his microphone and the mechanical mount leaped into the air. P2: John Carter insisted on accompanying the stricken princess. The parting had been sad for Sola and she was worried. P3: But Vovo, the wizard, was jubilant; eagerly he explained to the Earthman his recent mastery over gravity. P4: Woola watched his master disappear into the sky. He whined nervously; all was not well here -- even the brute knew. P5: "My studies of radium degravitators," Vovo explained, "resulted in banishment by my own people, who are highly superstitious." P6: No doubt that Vovo was a genius, Carter thought, but could the little wizard restore life to the girl's stony body? P7: Atop the plateau loomed a wild, dense jungle -- but where was the kingdom of which Vovo had boasted? 1. Again Sola is left behind in this episode. It is a separation that apparently goes on for weeks or months -- but, in the novelization, a fictional device can be used to shorten that separation down to only a few days. 2. In panels 3 and 5 of strip #23, Vovo brags about his scientific achievements -- he has mastered the control of gravity by experimenting with "radium degravitators," he says. Vovo also says that his "own people" banished him out of superstition, but he does not identify those "people." In the novelization Vovo will be identified as a Warhoon green man who was a late hatchling rescued by a Zodangan animal trainer and, as a child, sold to a scientific laboratory in Helium, about 1000 years before John Carter's advent upon Barsoom. Vovo grew up in the lab, absorbing a great deal of scientific knowledge, but was banished along with his master when that scientist became involved in an assassination plot against the royal family and seriously injured Jadoz San, the great uncle of princess Dejah Thoris. Vovo's master, Vo Dor, traveled to the Plateau of Eo and there he and his little green ward were taken in by the Wizards of Eo, a strange, secretive group of savant hermits who were served in all their needs by robots they had invented and produced in great numbers. At Eo, Vo Dor continued his program of covert assassination, eventually murdering the small band of "wizards." Soon afterward Vo Dor died when he inadvertently drank poison wine of his own concoction. His death (a century before Carter came to Mars) left the demented Vovo as the last "Wizard of Eo." 3. In the novelization Vovo will be portrayed as having "adjusted" the memories of all his mechanical servants, so that they honor him as their creator and serve him loyally, without question. Only in the case of the robot Oman was Vovo's work left incomplete, so as not to harm the mechanical man's creative thought processes. Oman's memory is clouded but not fully wiped clean. He suspects that Vovo is not honest and truthful -- but, until he witnesses the wizard lying to Carter and deceiving the Earthman, he is unable to penetrate the cloud Vovo has placed over his own age-old memory. 4. The Plateau of Eo is covered with jungle -- a rarity upon dry, cold Barsoom. In the novelization this jungle is shown to be actually a vast arboretum, made up of strange species of plants and animals, collected by the ancient wizards, from all over the face of the planet. CHAPTER 23: "THE FORBIDDEN PLATEAU"
Sola watched in anguish as the mechanical mount leaped into the air. Once again John Carter had left her behind while he made a desperate attempt to save the star-crossed princess. The parting was a sad one for Sola and she was worried that she might never see either of the humans again. It had been her idea to seek help in this mysterious place, but nothing was working out the way she had expected. She could only hope for the best, while her better judgment feared the worst. On the short trip to the wizard's tower Oman answered some of the Earthman's questions about the flying thoat. It was a recent invention from Vovo's laboratory and it marked the end of the little green man's life-long quest to master the force of gravity. But John Carter was a fighting man and he had little interest in such things as radium degravitators. All he wanted to know was how soon Dejah Thoris might be cured of the terrible ailment she now suffered. Years later the Earthman discovered an account of Vovo's life, written among the notes in a manuscript book, entitled "Pew Mogel, His Life and Wonderful Works." The author knew of Vovo's mentor and that red man's scientific research, which Pew Mogel belittled and dismissed with great contempt. But in that sarcastic review he discloses some interesting facts. Vovo was hatched in a Tharkian incubator, about fifteen hundred years before Captain Carter came to Mars. His egg cracked during incubation, robbing the green infant of much needed nourishment. When the hatchlings were taken away, to join the adult Tharks, the disfigured runt was left to die. However he was found and raised by an outlaw green warrior. This Thark pariah had gathered a meager retinue of fellow outcasts about him and the band lived in one of the smaller ruined cities on the northern fringe of the Tharkian domain. Too small and weak to fight with the males, the runt was raised with the female hatchlings and trained with them in the art of assembling weapons and ammunition. He proved to be a great genius in that trade and it was the boy's improvements in their radium rifles that gave the outlaw warriors advantage enough to survive the attacks of their enemies for several years. The outcasts were finally hunted down by the Jeddak of Thark. Only the young dwarf was not massacred. His bent little body and highly intelligent mind made him an object of amusement among the jeddak's troops. The young prodigy soon escaped them and made his way to Zodanga, where he was captured and placed in a zoo. The zoo subsequently disposed of its surplus animals, selling them to a scientist for laboratory experiments. So it was that the unwanted green genius at last came under the tutelage of the man who named him. This was the theorist and inventor Vo Dor, himself an exile from Helium. In the course of time one jeddak died and another came to power over the Heliumite Empire, and Vo Dor returned to his homeland, taking his green ward Vovo with him. There Vo Dor set up a new experimental lab and perfected certain innovative weapons, one of which came to the attention of an organized band of assassins. The scientist soon became involved in their plot against the new Jed of Greater Helium, who in those days was a prince named Tardos Mors. When the conspiracy was uncovered, Vo Dor fled his homeland for a second time to Zodanga. For some unknown reason he and Vovo did not complete that journey and they were never seen again. The imperial government of Helium seized Vo Dor's laboratory and inventions, many of which were put to effective use by the military. The account compiled by Pew Mogel ends at that point in time, adding only that most of the inventions credited to Vo Dor were really the creations of his assistant, VoVo the dwarf. John Carter, however, knew none of this biography when he was at Eo. All Vovo disclosed was that his superior intelligence "resulted in banishment by my own people, who are highly superstitious." Had the Earthman then known about the little green man's constant preoccupation with revenge and deception, he might have not fallen into the trap Vovo was setting. And, had he known that the so-called wizard had once been on the periphery of a conspiracy to kill the grandfather of Dejah Thoris, Captan Carter might have better guessed Vovo's hidden motives. As things turned out, it was not until years later that the bold Virginian put together all of the incriminating pieces of the puzzle that made up Vovo, the last Wizard of Eo. Atop the plateau loomed a great mass of dense vegetation. In the light of the two moons the seemingly endless expanse of foliage appeared to be a wild jungle. 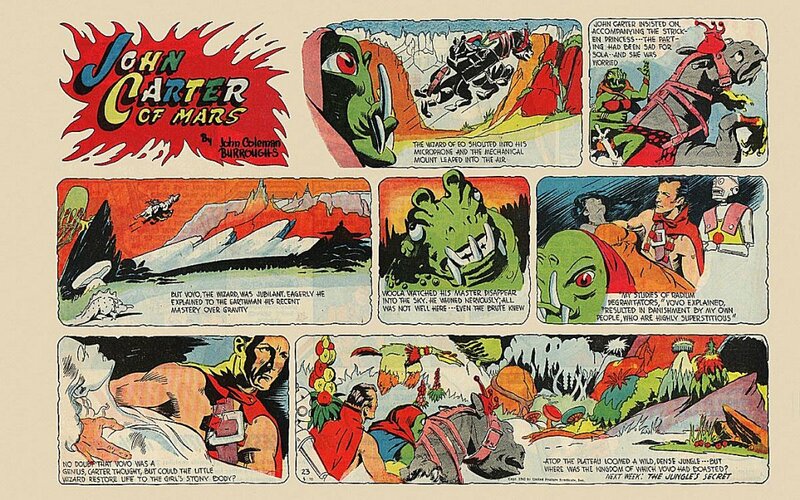 In the brighter illumination of day, upon closer inspection, John Carter's eyes would have revealed what his sense of reason was then telling him -- that such a jungle could not have sprung up and thrived in the dry desert of southeastern Mars without the protective care of numerous intelligent beings. Both Sola and the green dwarf had spoken of the Plateau of Eo as a place of advanced science and technology, but where was the urban area over which Vovo ruled? Carter discerned no civilization, no laboratories, no factories -- just unbroken forest, as far as the eye could see. "Oman," asked the Earthman, seizing upon a sudden inspiration, "your master called you an 'odwar' did he not?" "I am Odwar of the mechano-men of Eo," the robot replied. "How many do you have command over and where do they live?" "I have responsibility for ten thousand mechano-men. They are divided into ten companies, nine of which live within the caverns of Eo and one of which guards and maintains the city of Eo. The city occupies one square haad of cleared space in the center of the plateau. The garden and the ruins occupy the remainder." The Earthman guessed that what Oman called "the garden" was the vast jungle that covered the mesa from one side to the other. He did not think to ask what "the ruins" might be. Woola watched as his master disappeared into the night sky. He whined nervously; all was not well; even a brute with limited intelligence could understand that much. As she had done each night since their escape from Thark, Sola posted him to serve as watchdog while she got what little sleep she could under difficult circumstances. Woola, however, felt the call of a higher loyalty. He could not follow the strange thoat that had carried his master away into the sky, but the calot's sharp eyes saw the thing's path of descent and he realized that John Carter must be somewhere on the top of the vast flat mountain. That was enough for him to know; the wardog started up the trail to the forbidden realm of Eo. The green wizard laid the girl's body upon a narrow table, the top of which was surmounted by an ersite slab. Even in her rigidity the naked maiden was the very picture of regal elegance. He examined her eyes through a magnifying glass. The calicifying layers were thin and transparent; below them Vovo noticed the slow ebbing and flowing of blood in the tiny vessels of both eyes. "Ah-ha! Granddaughter of Tardos Mors! You are still alive under that stony skin, aren't you! How much Helium owes my genius -- can you even imagine? How much are you worth, red princess?"